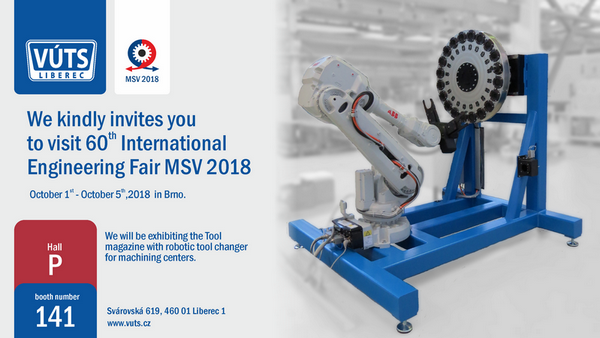 60th International Engineering Fair MSV 2018 will take place in Brno, Czech Republic, from October 1st till October 5th,2018. You can find us in Hall P, booth number 141. Our main exhibit will be the cylindrical tool magazine with robotic tool changer for machining centers. The cylindrical tool magazine is used for the automatic tool change in machining centers. The precise positioning is ensured by a servodrive with a cycloidal gearbox and the locks of the mechanisms are pneumatically controlled. The capacity of the magazine is 20 tools (max. weight is 35 kg with a roll moment up to 60 Nm). The magazine allows the lateral exit of 300 mm, therefore it can be used in many applications. The magazine includes also the control of tool presence during the automatic change. VISIT US, WE ARE LOOKING FORWARD TO MEET YOU.